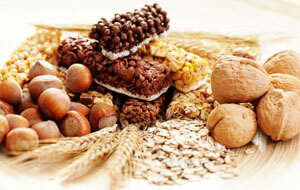 Dietary fiber is classified into two categories: insoluble and soluble. Insoluble fiber does not dissolve in water, while soluble fiber does. Insoluble fiber—found in nuts, wheat bran, whole wheat flour and many vegetables—helps promote the movement of material through the digestive system, increasing stool bulk. Soluble fiber—found in apples, barley, beans, carrots, citrus, oats and peas—dissolves in water to form a gel-like material which can help lower blood cholesterol and glucose levels. While dietary fiber is most known for helping to prevent constipation, it also helps lower blood cholesterol levels, helps control blood sugar levels, aids in weight loss, and helps reduce the risk of diabetes and heart disease. And eating fiber-rich foods helps aid in digestion and the absorption of nutrients. Dietary fiber includes all parts of plant foods that your body can’t digest or absorb. Unlike other food components such as fats, proteins or carbohydrates, which your body breaks down and absorbs, fiber isn’t digested by your body. Therefore, it passes relatively intact through your stomach, small intestine, colon and then out of your body. If you’d like to increase fiber in your diet try eating at least 2 cups of fruits and 2 ½ cups of vegetables each day. Replace refined white bread with whole-grain breads and cereals, and eat brown rice instead of white.